When I was a little boy, before I even understood what film was, I used to draw pictures on strips of construction paper and run them through the slats on the saloon doors between the kitchen and the dining room—a rough simulation of the way film works. (This was the mid-’70s, when people liked to pretend they lived in the Old West. We had a player piano, too.) Given my future profession, that’s always been a cute origin story, the innocent beginnings of a lifelong obsession. But if I decide to bore my children and future grandchildren with this story—and bore them I shall—they’ll look at me like I’m a crazy old coot. What do those crude picture strips have to do with the movies? A couple of months ago, major camera companies like Panavision and ARRI announced that they had quietly ceased production of film cameras in order to focus on developing digital cameras. 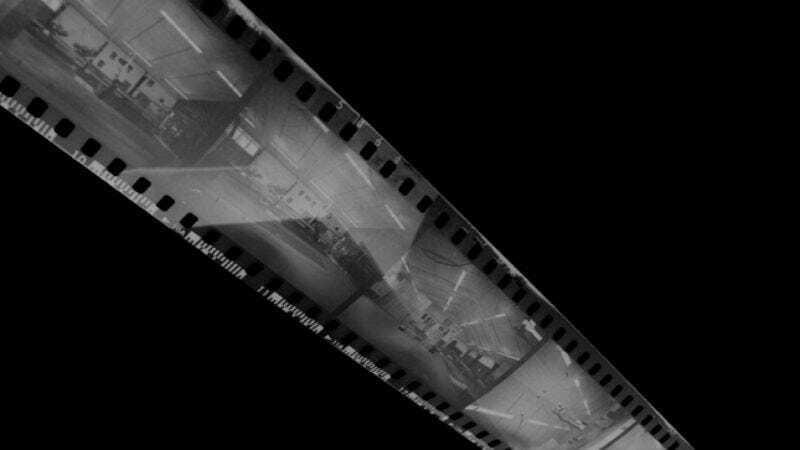 And that was just the latest sign that film as we’ve known it for 115 years—actual 35mm celluloid, run through a projector—is fading into obsolescence. Smart people have written eulogies for film already, and most have concluded, correctly, that the communal act of sitting in a dark theater and watching movies on a big screen will not die with celluloid. Filmmakers and exhibitors may have to think of more innovative ways to distinguish the theater experience from the home-viewing experience—something other than 3-D or holograms, please—but we are still social animals. Even when The Room is downloaded directly into our brains, we’ll still want to throw spoons at it together. Yet as the new digital order continues to assert itself—and it’s happening so swiftly that the passing of film feels more like sudden death than a slow fade—it’s become difficult to parse out how much of my grief is rooted in nostalgia and how much of it applies to real concerns about how the landscape is changing. Because working with celluloid was, for a time, my actual vocation: It started in high school, when my strong work ethic and equally strong aversion to customer service put me on the fast track from usher to projectionist at an eight-screen theater in Georgia. (First print ever built: Star Trek V: The Final Frontier. First botch job: Ditto. The final reel makes even less sense when it’s been spliced on tails-up.) It then continued in college, when I logged just enough time in the booth at the campus repertory house to afford a sustaining diet of grated cheese and Saltines. I’ve worked on platter systems and reel-to-reel, enough to appreciate (and, to a degree, master) the invisible artistry of the job. Audiences have the right to expect that a movie will run seamlessly through the projector—in frame and in focus and without bad timing on the reel change—but there’s a world of difference between professionals and the pimply-faced button-pusher at your local multiplex. Of course, that’s just nostalgia talking. Though the rise of digital has had its share of glitches, it’s largely eliminated the incompetent projectionist as an X-factor, and the framing and focus is spot-on every time. No more dashing out into the lobby, frantically appealing to some weary concessionaire to get someone to pleeease do something about the frame-line in the center of the screen. Designing machines that are more precise and easier to operate may contribute, in some small way, to the numbing automization of society—as prophesied by the chilling science-fiction film Idiocracy—but such is the march of progress. In an age when texting and smart-phone illumination has joined talking, kicking the seat, chewing loudly, and crinkling a plastic bag filled with popcorn smuggled from home on the list of movie-theater annoyances, it’s nice to have one less thing to worry about. But—and here comes the nostalgia again—there’s a tactile beauty to celluloid that’s so seductive, I can’t let it go without a fight. To me, the words “movie magic” evoke film being run through a projector at 24 frames per second, and the movies themselves routinely treat it with the same romanticism. You can know that persistence of vision is an illusion that isn’t exclusive to the format, but I can’t count the number of hours I’ve spent in a projection booth just watching those frames whirr in front of the light, creating in miniature the effect that’s being splashed on the screen. I’ve held prints of Duck Soup and Once Upon A Time In The West in my hands (and suffered the corrosive effect of the chemicals on my fingertips), and I confess to a love for celluloid that’s analogous to the audiophiles who have kept the vinyl market alive—yes, there are no scratches and pops on digital, but there’s a warmth and vitality to film prints that’s lost in the transfer to ones and zeroes. Clearly, this goes beyond nostalgia. The repertory scene may seem like a thin slice of the pie, especially to people who don’t live in big cities, but it’s at the heart of film culture, film history, and film preservation. When movies disappear from theaters, it often falls to repertory programmers and audiences to be the keepers of the flame. And the conversations I’ve had with friends who operate revival houses have found them in a grim mood about the immediate cost of the digital switch. With some studios having already shut down their film-rental business—and this after purging or making unavailable many of the films in their archives—they constantly have to scramble to import prints from overseas or private archives, or simply scrap plans to show certain films altogether. For them, upgrading to accommodate digital projection is not only undesirable, but beyond their tight-budgeted means. It’s inevitable—because it’s a studio and this is a business—that bean-counters will be coming around and saying, “Why do we have two people on our staff to distribute 35mm prints to a handful of venues in the U.S.?” Then the idea will be, “Nobody is showing film anymore. Why are we hiring people to send prints around when we should be just preserving it?” So I think that’s probably the next step. Then the question becomes, “Will the studios preserve their films on digital formats?,” whether it’s a DCP [Digital Cinema Package] or something as simple as a Blu-ray or a DVD to make available to venues. And my feeling about that is, “No, they probably won’t.” There are things right now that are only available on film that might not be available at all soon. The streaming and home-video market has not caught up by a long shot with the repertory catalogues. I’m concerned that smaller venues that aren’t part of larger institutions like ours are the ones who are really going to get hurt. And that means not only less venues showing repertory titles, but because the Marcus chains and the Regal chains aren’t going to be booking the Rialto re-release of Diary Of A Country Priest [alongside current independent or studio boutique titles], that business will suffer, too. Still, as troubling as the digital transition seems—and as utterly false as statements like Netflix’s Reed Hastings claim that “nearly every movie ever made is published on DVD”—I’m not a Luddite. The quality of digital filmmaking and projection has improved to an astonishing degree over the last few years, and the notion of cheaper (and more environmentally friendly) distribution at every end has its obvious appeals. And as Healy noted to me, 115 years of celluloid doesn’t mean that it’s always been watched in the same way. A nitrate print of Casablanca from 1945, projected via carbon arc, is going to look different than a more recently struck print projected via Xenon bulb. And that, in turn, will look different than a transfer to DCP. (Though hopefully not too different. The move to scrub movies of grain for Blu-ray reissues has distorted some beyond what’s acceptable.) Some will be able to distinguish one format from another; more casual moviegoers won’t. Beyond a love of celluloid that’s personal and perhaps to some degree irrational, what’s ultimately important is that film history and culture don’t get left behind. We’re in a transitional period now, and it’s a scary place, because the guardians of the medium—major studios and independents, archivists, repertory houses of all stripes, as well as critics and academics—are having to scramble to adjust to a new landscape. Maybe the scene will look healthy in 10 years; maybe it will slip into niche-y obsolescence. But if the death (or extreme marginalization) of film is upon us, it’s worth mourning. After all, celluloid running through a projector has been a window to the world for more than a century, and the thought of that changing, possibly for the worse, breaks this cinephile’s heart a little.